You may notice new signage at a couple of our local conservation areas outlining a new system of visitor day use payment! 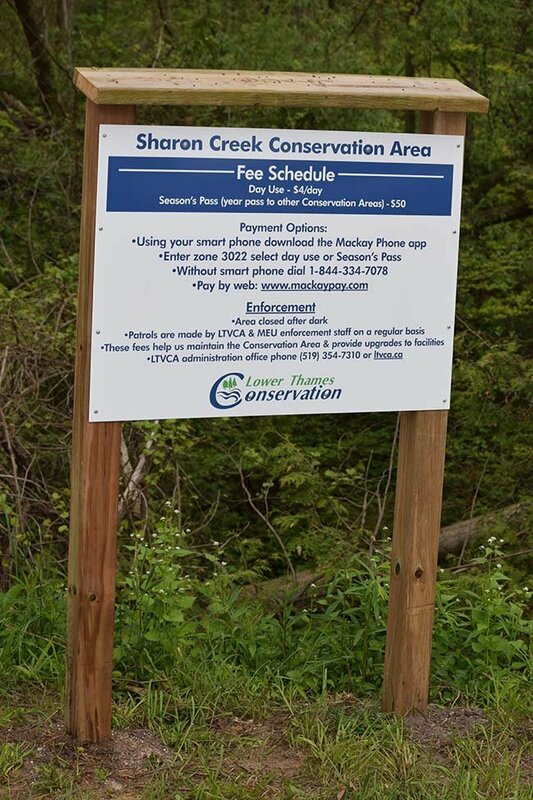 The Lower Thames Valley Conservation Authority (LTVCA) has implemented the Mackay Pay Phone app at Sharon Creek and Big Bend Conservation Areas. Through this smart phone app – visitors can pay $4 per day. Or for frequent visiting, consider the purchase of a year permit that provides additional day use access to all other LTVCA Conservation Areas including Longwoods Road and C.M. Wilson. Directions as to how to download the app or how to pay without a smart phone are on the signs. Sharon Creek Conservation Area is located in Middlesex Centre at 4212 Springer Road just southeast of Delaware. For details on facilities and features check out https://www.lowerthames-conservation.on.ca/locations/sharon-creek-conservation-area/ . Big Bend Conservation Area is located at 21239 Big Bend Road in Southwest-Middlesex. For details on Big Bend facilities and features check out https://www.lowerthames-conservation.on.ca/locations/big-bend-conservation-area/ . Big Bend campers can also use the Mackay Pay system to purchase overnight camping permits. The Mackay Pay Phone app is being implemented to streamline our payment methods, provide convenience for visitors and to also assist our enforcement officers who will be patrolling these areas. Funds raised from the fees will provide upgrades to the facilities at these conservation areas to improve visitor experience. If you do not have a smart phone, you can still purchase permits and passes in person at the Longwoods Road Conservation Area and the LTVCA Administration Building in Chatham during regular business hours.